Antonio&apos;s Lodge is situated on Northeast of Brazilian Amazonas State on the banks of Urubu River upstream, 03 and a half hour away from Manaus by car and boat. The Lodge provides our guests with an opportunity to experience the real magic of the jungle and interact with the natural environment of the high land forest. The architecture of this ecological Lodge reflects the traditional housing style of Amazon cultures with artistic painting and the rooms were been constructed using local materials sourced from the area without harming the environment. Upstream Urubu river has dark water, resulting from organic acids released by the decomposition of organic matters which kills bacteria and other parasites, remaining as a safe area for swimming and plus the advantage of being free of mosquitoes. The combination of dark water, high land forest and lack of mosquitoes provide an enjoyable and comfortable experience in exploring this area whether when walking in the jungle, camping, canoeing through the river channel and flooded forest, as well as many other activities. From the canopy tower you can enjoy the view relaxing in chairs at the top floor. It's possible to sleep in one of the two comfortable rooms of the tower with a private balcony. When choosing one of our tour there will be different type of accommodation at the Lodge such as the most attractive Private Chalet with private balcony facing the river, Bungalow with 3 and 5 private room all connected and private bathroom inside, dormitory with 4 and 6 beds with private bathroom. 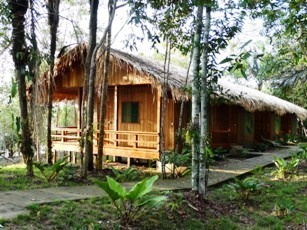 Enjoy a relaxing moment staying in hammock bungalow with a fantastic view of river. Therefore there is Restaurant all decorated with an artistic painting serving delicious regional food prepared by trained native cook, there is a terrace, in the same area of the restaurant, with a rustic clay stove that could be used by guest for preparing barbecue and social activities. 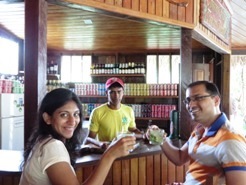 At the Bar is possible to try a popular Brazilian drink "Caipirinha". From the floating sun deck is possible to read book and practice to paddle a canoe by yourself before going on the tour. At leisure time in Lodge it is possible to walk around and appreciate different kind of orchids from the region.